It started when the DNR received a report on a loon that had not migrated. It was the day after Thanksgiving, and the lake was freezing. The loon was keeping a small hole open in the ice on Big Jay Gould Lake near Cohasset in Itasca County. Members of the Cohasset Fire Department used the "ice angel" air boat and wet suits to retrieve the loon. Early the next morning, the loon was taken to the Garrison Animal Hospital and was diagnosed with lead poisoning. An x-ray showed that a lead jig-head was in its stomach, and blood tests indicated a blood lead level of 2.28 parts per million (ppm). By the time the lead jig was removed, it was too late. The lead had already poisoned the bird. It died. Lead poisoning occurs in birds of blood levels greater than 0.2 ppm and birds usually die with levels greater than 1.2 ppm. A loon with lead poisoning behaves strangely. It may fly poorly, have crash landings or stagger onto the ground. The loon begins to gasp, tremble, and its wings droop as lead is carried through its blood stream. As the poisoning worsens, it eats very little and hides among aquatic vegetation, staying behind when other birds migrate. It becomes emaciated and often dies within two or three weeks after swallowing the lead jig or sinker. It takes only one lead sinker or jig to poison a loon. Loons routinely swallow pea-sized pebbles on the bottom of lakes. The pebbles pass to the stomach and help in digestion, like grit in the stomach of a chicken. When fishing sinkers are lost during fishing and drop to the bottom of the lake, they can be picked up by loons or by waterfowl like ringneck ducks and trumpeter swans. Some loons also swallow fishing jigs when they mistake them for minnows. As the lead sinker or jig is exposed to the acids of the stomach and to other pebbles, lead enters the bird's system and slowly poisons the bird. 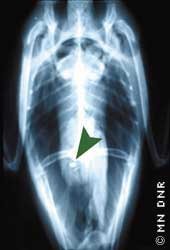 The loon photographs below show the small lead jig-heads (arrows point to them) that caused the lead poisoning of these birds. Give nontoxic sinkers a try. The less lead we release into the environment, the better off our wildlife will be. Next time you clean out your tackle box and make a list of replacement tackle to purchase for the upcoming fishing season, be sure to include nontoxic fishing sinkers. Currently there are many non-toxic sinker alternatives on the market made out of bismuth, tin, stainless steel, tungsten, ceramic, recycled glass and natural granite. Because weights of the different materials vary, you'll have to experiment to find what works best for your type of fishing. Ask your local bait and tackle store to stock environmentally friendly unleaded sinkers. Two examples are Gremlin Green and Bullet Weights. Some major discount stores have made a special effort to increase the variety and supply of non-lead sinkers. Never throw old tackle into the water or on shore. Consider lead sinkers and jigs as toxic material and dispose of them at household hazardous waste collection sites. To insure that future generations hear the call of the loon we need to safeguard their environment. Even if you don't fish, share this information with family and friends who do. Just tell them to "Get the lead out!" In 2003 Minnesota's loon population was about 12,000 birds, and the numbers appear stable. 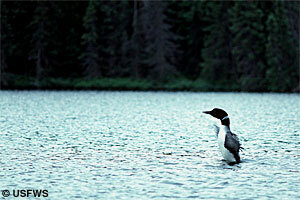 There are, however, some potential threats to the long-term survival and status of loon populations. One of those is the threat posed by lead fishing sinkers and jigs. The Minnesota Pollution Control Agency did a study to examine loons for high mercury concentrations. 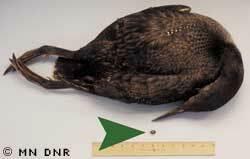 The mercury study incidentally discovered that loons were dying from lead poisoning. Out of 101 dead loons that were analyzed, a total of seven died of lead poisoning and an equal number died from fish line entanglement. The fish line problem is fairly straightforward and can be reduced by urging anglers to avoid disposing of waste fish line in our lakes. The lead poisoning problem is more complex. Biologists have studied the effects of lead sinkers and jigs on water birds and birds of prey since the 1970s. In areas where loons breed, lead poisoning from sinkers or jigs may account for up to 50 percent of the dead adult loons found by researchers. For more information on how to "Get the Lead Out", check the Get the Lead Out page at Minnesota Pollution Control Agency .